By Van Cushny for Thoroughbred Heritage. ©Van Cushny, 2006. 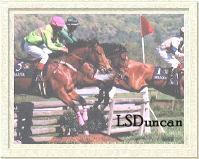 Van Cushny owns and operates steeplestakes.com, a popular web site that covers American steeplechasing. It's recognized that some flat-racing horses seem to prefer to do better on certain racetracks, and not others. This is even more true for steeplechasers -- witness the phrase "Aintree specialist," referring to jumpers that do best over that course. Here, Cushny talked to trainers and jockeys connected to famous American chasers of the late twentieth century, and got their assessment of their horses' preferences for certain courses. American steeplechase courses are as diverse and unique as the horses that race over them. Configurations and surfaces, sometimes even the directions the horses run in, vary from one layout to the next. Each horse brings its own set of assets to a meet, and the result, on occasion, can be magnificent. Lonesome Glory. 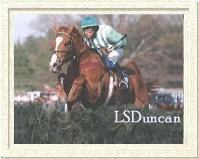 Photo courtesy Laurel Scott Duncan Lonesome Glory, perhaps the greatest steeplechase horse ever campaigned in America, did his best running over the difficult Springdale course in Camden, South Carolina. Overall, his racing career spanned 44 races and include 24 victories. But he was especially tough at Camden, winning seven of the 10 starts he made there. 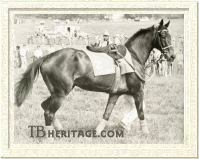 Owner by the late Mrs. Walter Jeffords, Lonesome Glory was trained throughout his career by F. Bruce Miller. "I think his success over that course can be credited more to the firm going [footing] that we usually got and the way the course was laid out," Miller said. "Lonesome Glory was a big-striding horse and he was a superior jumper. The course at Camden had big fences, sweeping turns and long straight-aways, and really favored a galloping horse like him." Lonesome Glory won the Colonial Cup three times (1994, 1995 and 1997) while also notching a pair of victories over the same course in the 1997 and 1999 editions of the Carolina Cup. As additional proof of his love for the sandy Springdale course, Lonesome Glory was undefeated in two starts on the flat there, both in the spring. The chestnut son of Transworld was undefeated in four trips over the course in March, while sporting a record of 3-0-1 from six starts made in the fall. "Both times that Lonesome Glory finished fifth in the Colonial Cup we scoped him after the race and found that he had bled [from the lungs]," said Miller. "That plus the fact that his competition was usually much tougher in the fall than it was in the spring explains his superior record over that course in the spring." Miller believes that steeplechasing's many different, unique courses more readily lends the sport to a horses-for-courses angle than flat racing: "It's a night and day difference. Other than the composition of the racing surface, each flat track is fairly similar to the next, while steeplechase courses vary significantly from each other. Some have sharp turns, others are hilly and some have an uphill run to the finish. Given those differences, I think you are much more likely to see a horse that favors one particular track in steeplechasing than you are in flat racing." Saluter. Photo courtesy Laurel Scott Duncan The mighty timber horse Saluter was certainly a perfect match for the course at Great Meadow, Virginia. Saluter won the about 4-miles Virginia Gold Cup at Great Meadow an amazing six years in a row from 1994-1999 before finishing third in the 2000 edition of the race. In addition, Saluter won the about 3 1/2-miles International Gold Cup run over the same course twice (1998 and 1999) before finishing second in that race in 2000. All told, Saluter made 13 starts over the Great Meadow course while winning eight of them, usually in dramatic come-from-behind fashion. "The course at Great Meadow was ideal for a one-paced horse like Saluter because it had big, sweeping turns," said Saluter's trainer, and regular rider, Jack Fisher. "It was a great galloping course. Saluter was like a big old army tank, he wasnt a handy horse, but as long as he could keep his momentum he was very tough to beat." Fisher also explained why Saluter had a better record in the Virginia Gold Cup than he did in the International Gold Cup which is run over the same course five months later: "Saluter needed all four miles of the Virginia Gold Cup to get rolling. The 3 1/2 miles of the International Gold Cup was too short for him, he needed four miles to get worked up, especially towards the end of his career when he wasn't as easy for to stay as close to the leaders as I would have liked." Was it the Course or the Horse? Where a horse is running sometimes matters more than the horses its running against. One of the best flat-racing horses of the 1980s, Easy Goer, was virtually unbeatable at Belmont Park in New York, winning seven of nine career starts there, including an 8-length romp in the Belmont Stakes that denied his arch-rival Sunday Silence a sweep of the Triple Crown. Their three other meetings took place at other tracks, and Sunday Silence won all three. Recently, steeplechasing's "I Love New York" horse was It's A Giggle. Trained by Hall of Fame conditioner Jonathan Sheppard, It's A Giggle won five of his seven career tries at Saratoga Race Course. It's A Giggle initially tasted success at Saratoga in 1998 when he won at first asking there, and he came right back to finish a close second in his next start over that course later that year. After taking the next two years off due to injury, It's A Giggle returned to his favorite track in 2001 and dominated the competition, winning all three of his starts at Saratoga, including the highlight of the meet, the New York Turf Writer's Cup (G1). After his remarkable success at Saratoga in 2001, owner William L. Pape dispatched It's A Giggle to Saratoga the following year, and promptly watched the bay son of Northern Baby win the A.P. Smithwick Memorial (G2), running his record to five wins and a second from six starts over the course. On the strength of that formidable record, he was favored to win the 2002 edition of the New York Turf Writer's Cup, but he failed to handle a boggy course that day and was pulled-up. "It's A Giggle was a big, sturdy horse who was better suited to a flat course rather than the up-and-down hilly courses you often find at hunt meets that suit a smaller, more handy horses," said Sheppard. "He also won the Royal Chase at Keeneland in 2002 because, like Saratoga, that course is a fair and testing course; a level-playing field, if you will." "If a horse ran well over a certain course, the connections are more likely to go back and run there again. However, a really good horse can win over any course . . . if the trainer keeps running him back at the same place, people then say he likes the course, but in reality, the horse would have won no matter where he ran." Flatterer Sheppard's best known steeplechaser, Flatterer, like Lonesome Glory, was also something of a terror over the steeplechase course at Camden. Flatterer was undefeated in all four of his career starts over the Springdale Course between 1983 and 1986, with each of his victories coming in the $100,000 Colonial Cup (G1). He established a new track record in the 1984 edition of the Colonial Cup, when he covered the about 2 3/4-miles distance in 5:09 flat under 160 pounds with jockey Jerry Fishback aboard. Owned by William L. Pape, Flatterer raced in the days before the Carolina Cup offered a big purse, so he never did compete in that race. Had the Carolina Cup offered a bigger purse in the '80s--it's a $100,000 pot now--Flatterer could well have broken Lonesome Glory's record of five steeplechase wins in Camden. "The Springdale Course in Camden is a fair and testing course," said Sheppard. "It's a true test of class, stamina, speed, and endurance, as well as jumping ability because they jump the big, natural fences there. The cream really rises to the top over that course. Flatterer was often assigned more than 160 pounds in the last four years of his career, and that weight stopped him in some of his other races, but the Colonial Cup was one of the few weight-for-age races in the '80s, and that's why he was able to win it four years in a row." Flatterer carried 170 or more pounds five times in his illustrious career, winning three of those races. His stiffest impost came in the 1986 Middleburg Handicap, when he was assigned 178 pounds. Flatterer finished third that day, beaten 6 1/2 lengths. "The course at Middleburg has a lot of ups and downs and very tight turns, and didnt suit Flatterer at all," said Sheppard. "It's very hard to make up ground over that course, especially carrying 178 pounds." Another horse who didn't care for the numerous hills and tight turns of the Middleburg course was Armata Stable's Welter Weight. "He hated that course," said his trainer, Tom Voss. Timber racing, in fact, takes the horses-for-courses angle to perhaps its greatest extreme. These races are longer than National hurdle events and the fence sizes are daunting, especially in the springtime Maryland events. While Welter Weight disliked Middleburg, he excelled over the big wooden fences at the Grand National timber races in Butler, Maryland. He was victorious in five of seven career starts over that layout, losing the other two by narrow margins. Voss lamented Welter Weight's two Grand National losses: "Both defeats came at the hands of Buck Jakes, who was aggressively ridden by Anne Moran. Welter Weight was a better horse than Buck Jakes and Welter Weight would have been undefeated over that course if he had been ridden as aggressive as Buck Jakes was in those two races." "Welter Weight was very good at the three-mile distance, but four miles was too long for him," said Voss. "He could beat any horse at the three-mile distance." Sam Son of a Gun, who competed in the late '70s and early '80s, was a Monkton, Maryland legend. He won at My Lady's Manor four straight years (1980-1983) and during one stretch he was won eight of 10 timber races. "Sam Son of a Gun loved the long hill at Monkton," said Charlie Fenwick, who rode the horse to many of his victories. "He took it easy on the way up and then would come flying down the other side of the hill as fast as he could." Conversely, this was the same course that worked against the best timber horse of them all, Saluter. Fisher said, "My Lady's Manor has tight turns that you have to slow down for. Saluter wasn't as effective over those courses because it would take him a while to get rolling again after the sharp turns." Was it Great Meadow that made a great horse out of Saluter? Why did Camden light competitive fire inside Lonesome Glory? Was It's A Giggle born to race at Saratoga? Probably the one thing everyone can agree on is that for whatever reason these particular horses were at their very best at these particular places. And that their trainers were smart enough to keep returning them there. Fisher said, "Saluter knew where he was when we brought him over (to Great Meadow), no doubt about it. He seemed to raise his game to another level each time he ran over that course." ©2006 Thoroughbred Heritage. All rights reserved.